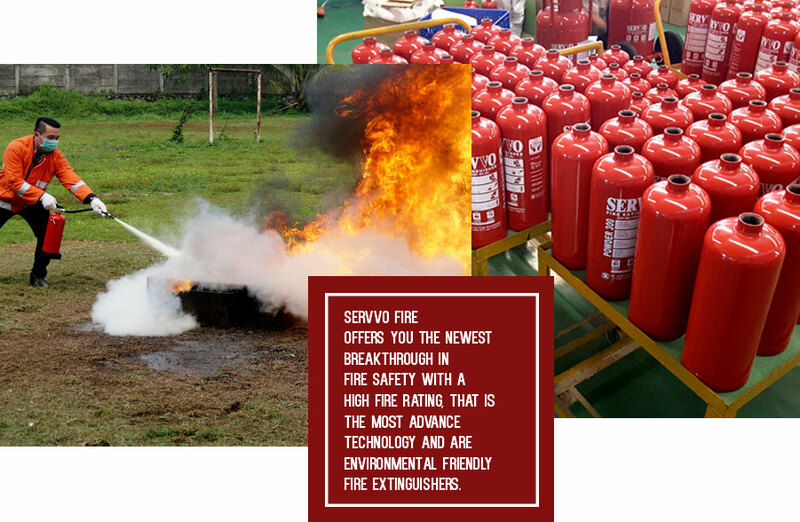 SERVVO FIRE offers you the newest breakthrough in Fire Safety with a high Fire Rating, that is the most advance technology and are environmental friendly Fire Extinguishers. SERVVO is the right choice for those who prioritize quality and high performance Fire Extinguishers. Supported by our international skillful and experienced experts SERVVO has created reliable products with a wide range of products and product sizes. SERVVO uses seamless cylinder technology that are equiped with safety valve to prevent over pressure. We use national and internationally certified agent (Department of Labor, the ministry of Environments, Indonesia Fire Department, UL, EPA). SERVVO’s Product is produce base on International standard NFPA, under ISO 9001:2008 quality management control. The variety of SERVVO’s products consists of Dry Chemical Powder, Clean Agent, Foam and Carbon Dioxide. These products covers a wide range of fire classes. © 2016 Servvo.com - The Best Fire Extinguisher. All rights reserved.